Have you heard the saying, ”Successful people learn from their mistakes; the most successful people learn from the mistakes of others.”? There’s so much truth behind that statement, and throughout the past 7 years I’ve seen first-hand how learning from other people’s mistakes can help you benefit and grow your business by not making those same mistakes yourself! After having met with many different healthcare professionals, we’ve learned that we all have our own unique issues, which usually require their own unique solutions. Steve: Hi there, this is Huyen Truong and I am Steven Tait and you’re listening to Online Marketing For Doctors Podcast. Have you ever heard the saying, ”Successful people learn from their mistakes; the most successful people learn from the mistakes of others.”? After having met with many different healthcare professionals, we’ve learnt that we all have our own unique issues, which usually require their own unique solutions. However, we’ve also noted similarities in mistakes across the board and in particular, 7 common mistakes or issues that seem to plague (happen a lot to) healthcare practices. Because we’re here to help you and your own unique practice, we want to explain these fundamental mistakes to save you time, money and help you and your practice reach maximum potential! In order to market successfully, you need to have a clear picture of your target audience. Every medical practice needs a marketing strategy, and unfortunately it’s almost always the last thing to get done. We define marketing as who, what, where, when, why and how healthcare practices interact with their target audience. Steve – So No – your target is not ‘everyone’ who has certain health or cosmetic problem. No matter what product you sell or service you deliver; targeted marketing will give you a better return on investment. If you try to be everything to everyone, your message becomes vague and will have less impact. When you talk to everyone, it actually means you are talking to no one! Targeting a specific audience places you in front of them more often, with messages that touch them emotionally. Huyen – Yes, definitely correct, we are taking an example of a plastic surgeon who might think their target audience for his “breast enlargement” surgery is for anyone who has small breasts – so how does he craft a marketing message that will resonate with his specific target audience in these 02 scenarios? When I started out around 13 years ago, I did SEO and Web Design for small businesses, which is as you know a very generic and large audience – up to 90% of all businesses in Australia are small businesses. So with such a large, very vague target audience, I was pretty much talking to everyone: a removalist, a fashion retailer, roadside assistant, hotel and spa owner… you name it! Steve – When you try to do that, you’re really marketing to NO ONE. So, for successful marketing, you always need to ensure that you have a clear picture of the patients who are the targets of your products/services. What are their needs and wants? What are their hopes and dreams? What are the reasons they buy? Are they rational or emotional? First of all is the Waste of money, time and effort creating a marketing campaign that was not tailored and promoted to the right audience. For a successful business you need clarity on your direction, your plan, your goals, and your niches. Take a moment to think about your business and then ask yourself – what is the most important word in business? My clients give me a lot of different answers including money, investments, products, patients, “passion” and various other responses. While these are all good words and relevant, they are not the ultimate ONE word that needs to be central to everything you do within the business. This is the word that everything else falls beneath. Without allocating time and a great deal of thought to this word, you will never be able to take your practice to the next income level. So, by now I bet you’re curious to know what it is? Time and time again when we ask medical practices about the type of strategies they use, we find that many of them don’t have a business strategy in place. As many of them don’t have a marketing background this is understandable, yet strategy is so important they should definitely seek out some help and guidance to get one in place. With no great strategy in place, you’ll lack the clarity needed to align your efforts to ensure that you’re going in the right direction. A strategic plan is an essential tool needed for your practice to move forward. Who you are, and how you position yourself in the market place? What unique value you have to offer your patients, and to be distinct within the marketplace? How you are going to operate in the strategic way to serve that marketplace? Where do you want to be in the next 5 years? What goals do you want to accomplish? What size of business do you want to become? How can you scale the business to that level? Who are your ideal patients and how you plan to target them? What are your key differences to other businesses – including your niches, your value propositions, your positioning? How can you leverage your strengths, diminish your weaknesses, seize opportunities and deal with potential threats? Do you have a current marketing strategy to guide all of your marketing efforts? What particular set of activities do you plan to implement in order to target and maintain your niche customers and compete with existing competitors in the market? Do you want to position yourself on price or as a quality provider in the market? Is your practice one that charges at higher levels than other similar practices, but delivers super high quality products or services/ and amazing customer service? Therefore, your online marketing campaigns should be aligned with your overall business strategy in order to maintain consistency of your company’s positioning and goals. 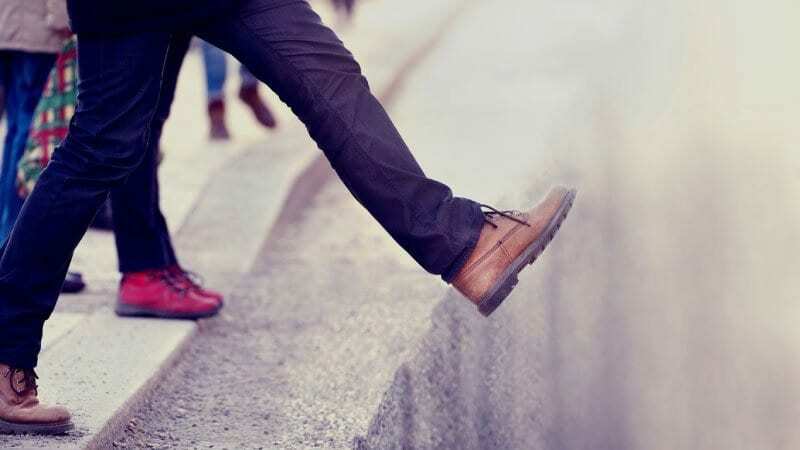 What are the negative consequences of no strategic plan? First of all, it is hard to sustain the business in long-term both online and offline. Now as you know, running a practice can take over your entire life and change almost every aspect of your routine. So, how do you make sure every aspect of your business is getting the right attention it needs and deserves to thrive and grow? Also, how do you scale and generate profit for your practice – while doing the minimal amount of work? Our answer is very simple: You need to automate. Marketing automation seeks a simple goal: Automate every part of the process to allow you to spend less time marketing, and more time profiting. And if you get it done right, you can save many precious hours every week that you can then dedicate to your practice growth. Time is precious, so you can start by outsourcing tasks that you simply don’t have time for or the right skills to do, for example: social media, web design and maintenance, SEO, Facebook ads, Google Adwords and more. Our business “to-do lists” can very quickly build up, seem endless and spiral out of control, so why not get some help for the smaller tasks others can handle for you. One of the biggest mistakes I see from practice owners is that they try to do EVERYTHING themselves. It seems to be a common mistake among entrepreneurs, but you need to remember that it’s not YOUR job to personally handle every part of the business. There are lots of other small tasks you can start automating, such as your bookings, scheduling, appointment reminder emails & text messages, asking patients for feedback, etc. 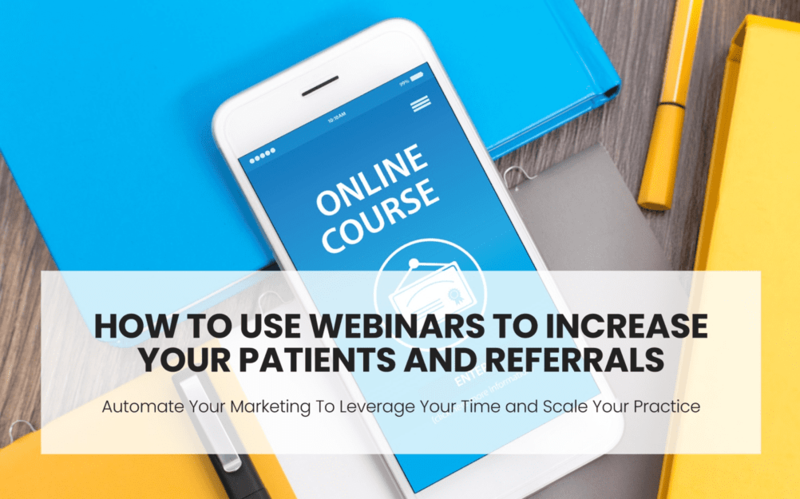 Webinars are a fantastic way to grow your practice and increase your patient base, and they especially work well for medical and healthcare practices and any premium services when users need more information and involvement before making decisions. Utilising webinars is a great way to connect with your patients and referring doctors on a more personal level through your voice and visual presentation. Webinars can be pre-recorded to save your time and also make it flexible for attendees as well. Unlike live seminars, with pre-recorded webinars your audience can attend whenever they like, they don’t need to travel, and can view from the comfort of their own home. The importance of marketing automation urged us to produce a separate video for this topic called “8 Steps to Automate Your Marketing & Scale Your Practice Up”. Please take time to view this link in our show note – you won’t regret it! Having a bad website – or not even having a website! In this day and age a strong online presence and an online form of contact is crucial. We have literally seen so many well-established doctors, who have been around for years and have multiple practice locations, with outdated or non-functioning websites. Poor websites give the impression of a small, badly functioning practice – but in reality these doctors are doing amazingly well! So don’t make the mistake of having an outdated or badly functioning website pop up on a potential client’s browser or mobile device. Nowadays everyone is online “Googling” for more information. Potential patients will likely be researching online before committing to a procedure or treatment. Also, referrers sending patients your way, will surely check you out online first to learn more about you, and to see any reviews about your practice out there. 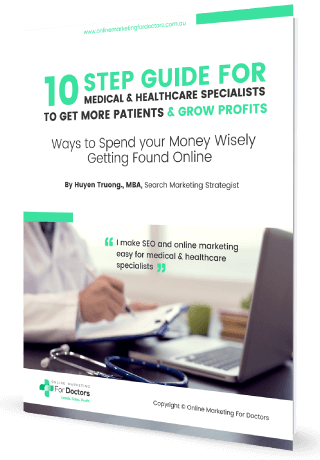 Huyen – This presents a challenge to you, especially when the majority of medical practices’ websites are so out of date and not even viewable on mobile devices (where more than 50% visitor traffic comes from!). We all have websites we hold onto for way too long that are way past their prime, but because they technically still function you might think why bother replacing them? We also made a video called “What Medical Website Elements Will Bring in More Patients” for you to learn more about this topic. So please check them out in the show note below – they’re definitely worth viewing and We are happy to answer any questions you have! You know that your competitors are probably eagerly whispering into the ears of your best referrers right now, every single day, right? We all know the importance of doctor referrals within the medical industry, especially for specialists. It’s a topic many medical practitioners come to us to get help with. The question is, how do you build doctor referrals naturally and professionally without appearing needy or greedy? The answer? You need a system. Assuring a regular flow of referrals from practices, hospitals and other healthcare businesses requires a regular, systematic—even scheduled—amount of time and attention. Few medical professionals want to be seen as a “salesman.” Even those who are comfortable in the sales role rarely feel they have the time. 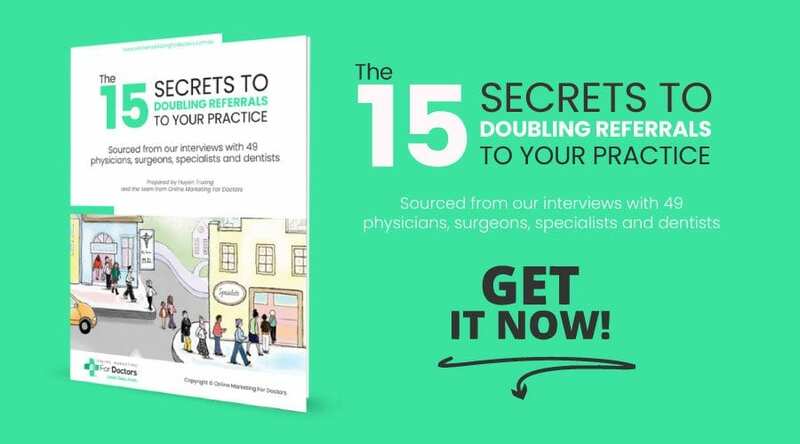 Huyen – With regards to referral marketing, my team and I have conducted research and wrote an eBook called “The fifteen secrets to Doubling Doctor Referrals to Your Practice”. These 15 secrets have been sourced from our extensive research, experience and interviews conducted with 49 doctors, physicians, dentists, and specialists from different areas. We’ve spent a lot of time and combined experience to gather the best ideas to help you grow your referral base. Just for you, we’ve left the link to download this eBook in the show note of this episode – so please check it out! We’ve seen many medical practices running banner ads in local newspapers or professional magazines – yet they never really know how effective this form of advertising is. Why? Because they can’t track it. If you can track it, you can manage it. Tracking is as important as doing. Advertising and marketing efforts are not just simply a business expense. If they have a plan and a purpose, they are an investment that requires tracking and a quantifiable Return-on-Investment (ROI). Before you launch any strategy and tactic in your healthcare marketing plan, create a system that carefully accounts for results. For example, how are you tracking the number of new patients, or the change (which is hopefully an increase) in revenue for specific cases or procedures? Without a measurable ROI you’ll never know what works, or what doesn’t work. Years ago, practices were built on the quality of services delivered, not the quality of marketing campaigns that were produced. Some medical schools don’t even teach or advise doctors to market themselves. But, without marketing, how can a young practice come into the existing market? Or how can an existing practice grow to the next level without marketing or simply just putting you out there more? Also, how can a medical practitioner take more doctors on board so they can leverage their time and reduce trading time for money? Through some of my own research it has become apparent that that doctor is actually marketing himself to the community. Patients are now empowered to pick their physicians and have many resources to find out information. Existing patients may have some insight about what you do (or did for them). Your colleagues probably have a taste for your professional or clinical reputation. But, for the greater purpose of marketing outreach, your need is to reach people that DON’T know you, or those who should know MORE about you. Thanks so much for tuning in and we’ve love to hear from you with your feedback or comments! What are some other business or marketing mistakes that you have unfortunately experienced in the past, and what have you done to fix them? Our medical practitioner community would love to hear your stories so leave your comments now, once you are there be sure to subscribe to our blog, or Itunes, Google Stitches, Player FM. If you want to listen to any particular topics, please fill out a 1 min survey that we put the link in the show note so we can produce that podcast topic for you. If you want to be our show guest, that is even better, email us and let us know what topics you would like to talk about. This is the first podcast channel in Australia about medical marketing and we aspire to make this channel a world-leading channel for the healthcare professional community. The podcast will be a Q & A interview style format, and it would only take up to 30 mins of your time. We can’t wait to have you on our show and we look forward to seeing you next time.